﻿ 5 ways to thank your staff just in time for Thanksgiving | Situation Management Systems, Inc.
Who hasn't found themselves asking "where did the time go?" over the past couple weeks. Thanksgiving is, once again, right around the corner and Christmas is following faithfully at its heels. While most people see visions of fluffy mashed potatoes and warm apple pie, it is important to remember that Thanksgiving is truly about giving thanks. And it provides employers with the perfect time to let their staff know just how much they truly appreciate their daily efforts. Gratitude can go a long way in the professional world. Whether it be via giving out thoughtful holiday treats or simply taking the time to notice a job well done, giving your employees thanks can help build relationships, improve communication and overall make your office a happier place. Here are five great ways to show your employees how grateful you are to have them, just in time for the Thanksgiving holidays. "Don't forget to add a healthy dose of gratitude into your office feast." 1. Have an office meal: Who doesn't love a healthy helping of some good food? Thanksgiving is a great time to try and get all your employees in one place for an office meal. Inc. contributor Marla Tabaka suggested taking a break from the typical potluck and getting a catered meal for your staff. Let your employees enjoy some good food without having to worry about preserving their mashed potatoes on their morning commute. Tabaka noted not to forget to add a healthy dose of gratitude into the mix, let your office know how much you appreciate them before you dig into that tempting turkey leg. 2. The gift of time: Forbes contributors David Sturt and Todd Nordstrom look to the thing many employees value most: time off. The two suggested giving your employees a thoughtful note with a heads up about when they can take off. When it comes to the holidays, an extra day to prep is always appreciated. If your company can afford to grant this gift to your employees, give it a shot. For bigger companies, Tabaka suggested rotating the days off within the company. Let half the office lose the Wednesday before Thanksgiving, let the rest enjoy their post-turkey comas at home on Friday. There are ways to switch it up to ensure your company still stays productive during the holiday season. 3. Appreciate their work: Nothing inspires people more than knowing their worth. A well-crafted compliment can be better than even the most expensive gift. According to a study by the O.C. Tanner Institute, 37 percent of workers view positive recognition as the ultimate motivator for producing good work. Your praise can work to kill two birds with one stone. Give your employees the gift of gratitude while also motivating them to produce better work. Sounds like a win-win gift to us. "When words aren't enough, showcase your creative side." 4. Thank-you wall: When words aren't enough, showcase your creative side. Tabaka suggested buying some decorative sticky notes and crafting a thoughtful message for each employee. Stick all the notes on a wall in your office and leave extras to let employees create their own. This public display of appreciation is a great way to acknowledge how everyone's good work contributes to a stellar company. Leave your workers with a positive feeling about their efforts before they head off for their holiday travels. 5. Remember their outside lives: An innovative way to show your thanks comes in the form of home upkeep. Sturt and Nordstrom noted that providing your staffers with at-home services can be the best way to show your gratitude. This gift has the added bonus of showing you recognize and care about their lives outside the office. The duo offered examples such as a voucher for a free day of house cleaning, child-care or snow-removal. 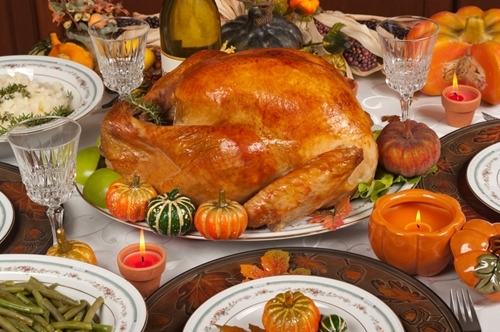 During Thanksgiving these treats can provide your employees with some major relaxation. Instead of worrying about clean up, they can sit back and enjoy a nice glass of wine. It doesn't truly matter which way you choose to say thanks, as long as you say it to begin with. Employees with appreciate the gesture and in turn feel grateful themselves to work at a company like yours. Personal power in a negotiation is your knowledge of the negotiation process, your face-to-face influence ..